Notification—The generator must notify EPA (using Form 8700-12) no later than 30 days before a planned episodic event or within 72 hours of an unplanned event. Notification of an unplanned event may be made via phone, fax, or email with follow-up submittal of Form 8700-12. The required notification includes identification of an emergency coordinator. A VSQG would also have to obtain an EPA ID number. Marked/labeled with 1) the words “Episodic Hazardous Waste,” 2) an indication of the hazard(s) associated with the contents (e.g., the applicable hazardous waste characteristic(s), a DOT label or placard, an OSHA hazard statement or pictogram, or an NFPA hazard label), and 3) the date that the episodic event began. In compliance with new §262.16(b)(2) for SQGs. For episodic wastes at VSQGs, containers must be in good condition, compatible with the hazardous waste being accumulated therein, and kept closed except to add or remove waste. Marked/labeled with 1) the words “Episodic Hazardous Waste,” and 2) an indication of the hazard(s) associated with the contents (e.g., the applicable hazardous waste characteristic(s), a DOT label or placard, an OSHA hazard statement or pictogram, or an NFPA hazard label). Inventoried using onsite logs or other records that identify the accumulation start and end dates (for VSQGs, only the date that the episodic event began). In compliance with new §262.16(b)(3) if the site is an SQG. For episodic waste at VSQGs, tanks must be in good condition, compatible with the hazardous waste being accumulated therein, have overflow prevention measures or equipment in place, and be inspected daily. 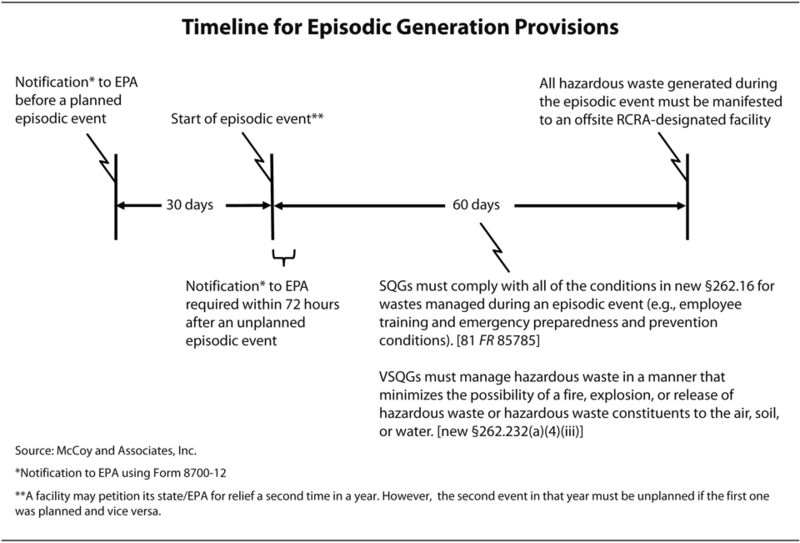 Accumulation time—Hazardous waste generated during an episodic event must be manifested to an offsite RCRA-designated facility within 60 days from the start of the event. This manifesting requirement applies to VSQGs as well as to SQGs. SQGs also have the option of treating hazardous waste generated during an episodic event within the same 60-day time frame. EPA noted that a generator could start and complete multiple projects (e.g., a small demolition project, a tank cleanout, and removal of excess chemicals) at different dates within the 60-day time limit, so long as all projects are completed within the 60-day start and end dates identified on the notification. Under that scenario, all hazardous waste generated would be considered part of the same episodic event. [81 FR 85783] A timeline for episodic generation under these new provisions is shown below. Recordkeeping—Records of the episodic event must be maintained for 3 years from the end date of the event. The information that must be kept is identified in new §262.232.